came back to me immediately. You can always count on Phil to hand out Guernsey during a contest. 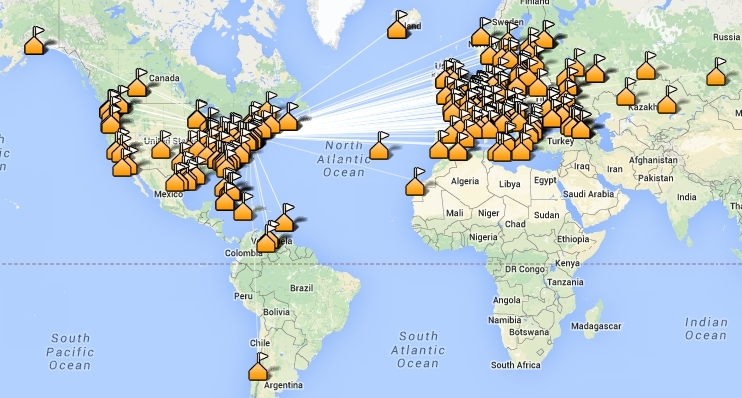 Activity stayed pretty high through the entire contest where I wrapped up with 684 QSOs, 850 QTCs and 521 total multipliers, I think my highest WAE RTTY score to date. 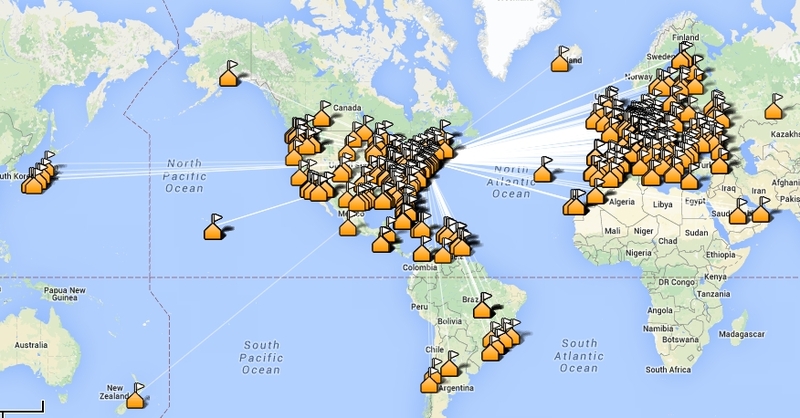 This past weekend was the annual WAE SSB contest here non-EU stations can only work EU stations. The WAE contests support QTCs which is an exchange of up to 10 other contacts (time, call and serial number) that were made. Each previous contact can only be sent once and a max of 10 QTCs can be sent to any station during the contest. QTCs add points but not multipliers and its a quick way to potentially double the number of points made. QSL DO YOU HAVE QTCS FOR ME? 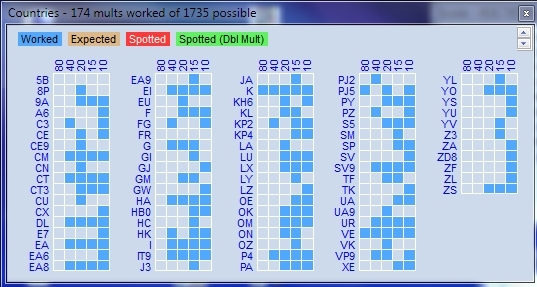 I made the QSO with DL9ZZ which is a point and possible mult and then I get 10 more points for the QTCs exchanged. I worked a little while on Friday evening when the contest started but most of the contacts were made on Saturday starting later in the morning. Most activity was on 15m & 20m as you can see from the summary below. It’s pretty easy when you just leave your antenna pointed at Europe vs rotating it throughout the contest. For my 40m and 80m contacts it’s the wire that hangs between the trees in my yard – no rotation needed. My local club was planning on a group VHF contest gathering but the weather was rainy on Saturday so we decided to cancel it. That gave me more time to work the WAE contest. There was no shortage of stations that wanted QTCs and often I didn’t have a full bucket of 10 to send but they wanted what I had. If I sent them a partial number (less then 10) I might stop by if I heard them later and could send them more. I even came back to some loud stations where I previously made a QSO with but didn’t have any QTCs to send and just sent them QTCs when I had them available. Sunday was a NY Giants NFL football home game and I was going with the family to it. I was gone most of the day (8+ hours) and after coming back home I got on and tried to make more contacts. I should have stayed home instead of going to the football game since I got sunburned and they played poorly and lost. I might have had more fun making contacts, though hanging out with the family was really enjoyable. Sunday late in the day with just a couple hours left, I was hearing lots of EU stations but I worked them already. I probably should have found a frequency on 20m and started calling CQ but by the time I got home from the game I was pretty beat so I just spun the dial. I ended up giving out the same number of QTCs as QSOs that I made which is as optimal as you can get in this particular contest. No lack of folks that asked for them and wanted as many or as few as you could send. Below is my score which shows the QSOs and QTCs per band. Earlier in the week I brought my older daughter down to Clemson in SC to start her 3rd year there and now it was time to move my younger daughter into her NYC apartment before she gets started on her 2nd year at LIM College. So there really wasn’t a lot of time to get on the air but I managed to squeeze in some contacts in both the SARTG RTTY contest and the NAQP SSB contest. In the SARTG contest I caught a little bit of the 1st of the 3 sessions over the course of the weekend. Missed all of the 2nd session. On Sunday morning 20m was active for the 3rd SARTG session. 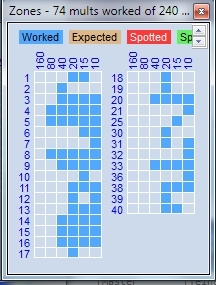 Happened to hear 2 loud JA stations while pointing to EU and worked them both before I spotted them on the cluster. Worked a bunch of JAs on 20m. 15 m was open at 8am ET / 1200z. I ended up working more JA mults then Canadian mults in the contest. With 135 Qs in the SARTG my wife and I headed back into NYC on Sunday to finish up getting her straightened out in her apartment. The NAQP SSB was also that weekend with most of the activity taking place during the day or early evening on Saturday while I was in my daughters apartment putting Ikea furniture together until my fingers were bleeding! When we got home late in the day I sat in the chair and worked as much as I could before I just needed to get some sleep. You can tell from the summary below that I was on 40m & 80m mostly vs any daytime activity that would have occurred more on 20m and 15m . But I made some contacts and can’t complain at all. Not bad with 262 contacts made in a weekend I didn’t think I’d even be able to turn on the radio. Daughter moved in, QSOs made, logs sent to all services/sponsors, and I’m a happy fellow! Apologies again for the late post.